Ever since I first made this bread almost four years ago, I still can't get over how simple and easy this bread is to make. It does not require a mixer or any special equipment and it will be the crustiest, moistest loaf of bread you will ever eat. My mom asked me if I wanted some pecans that a good friend had brought with her from St. George from her pecan tree. Looking at these pecans, I knew what I needed to make. Every time I walk into my local Harmon's grocery store, I will ask for a sample of their artisan White Chocolate Pecan bread. 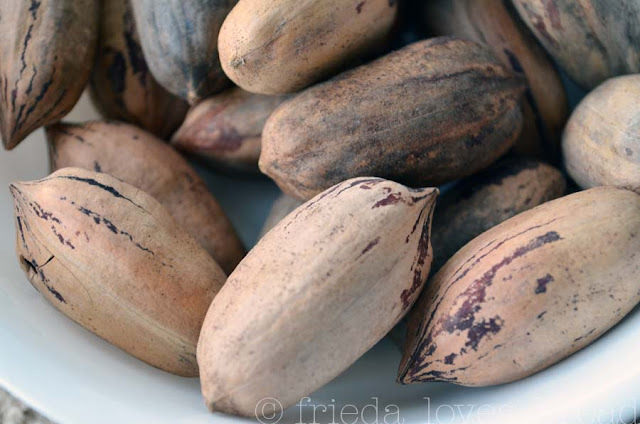 Crusty, dense, full of airy holes and studded with pecans, you will taste a slight sweetness of white chocolate. 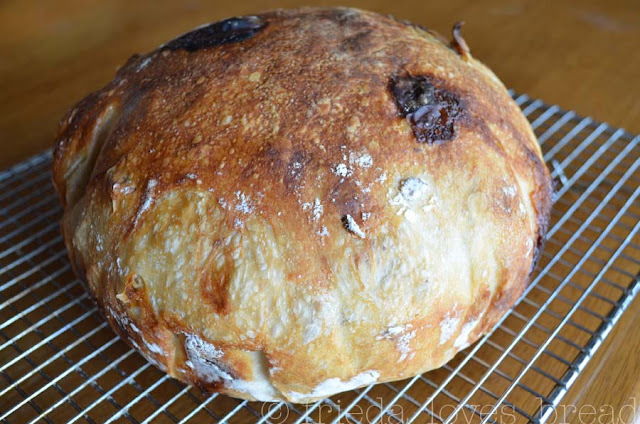 Why not try it as a no knead bread recipe? A serrated knife is great for chopping up chocolate. Coarse chunks are all you need. 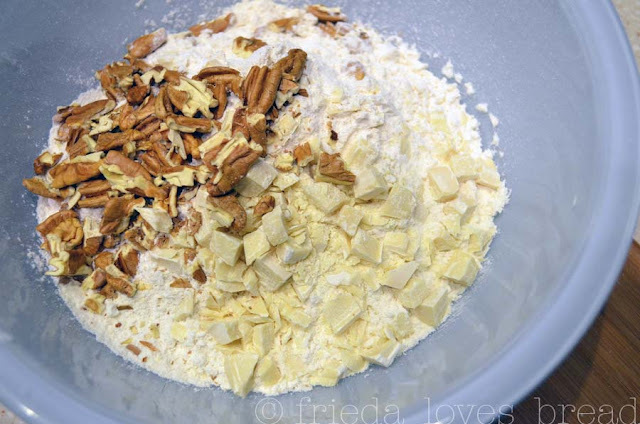 Toss the coarsely chopped pecans in with the white chocolate in your flour, yeast, and salt. Give it a good stir. Pour your warm water over this mixture and give it a quick stir. Don't worry about getting all the lumps out. Your mixture will look like a very thick, lump biscuit batter. Well, at least for the next 12 - 18 hours. Cover this with plastic wrap and let it sit on your counter overnight. The next day, this is what your dough will look like ~ airy and bubbly! Put about 1/2 cup of flour on your counter. 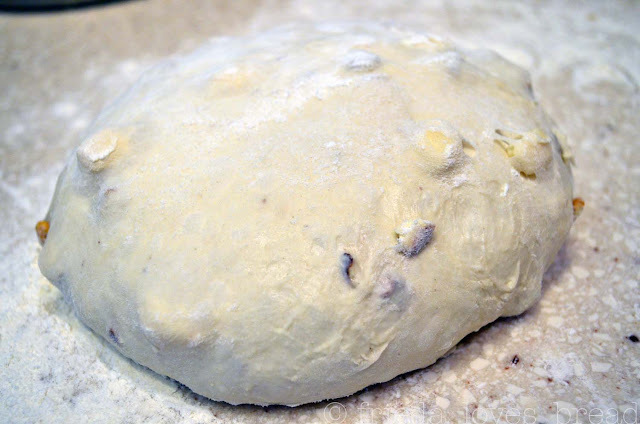 Dump the bread dough on top of the flour. 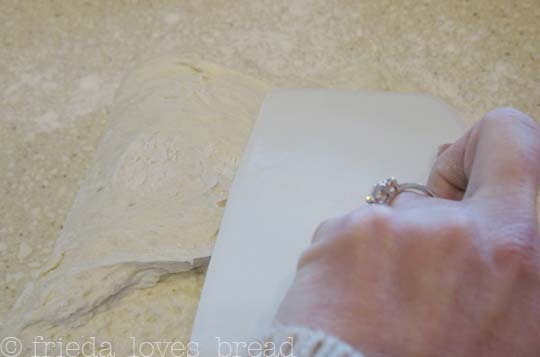 With floured hands (I like to use a plastic dough scraper), fold the dough into thirds. With floured hands or dough scrapers, quickly shape it into a ball, tucking in the edges underneath the ball, adding more flour to your hands if you feel like it is getting too sticky to handle. 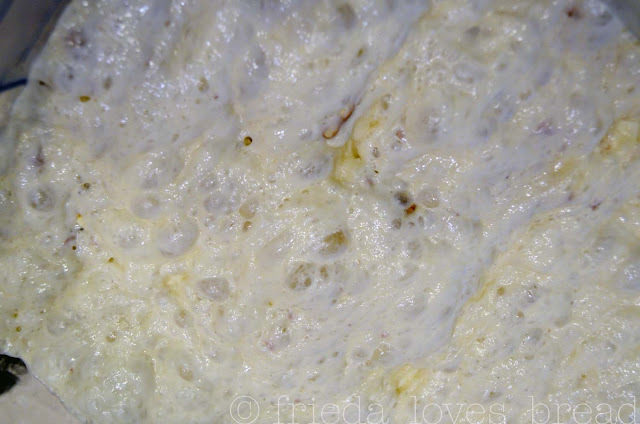 This is not kneading; it is simply shaping the dough. 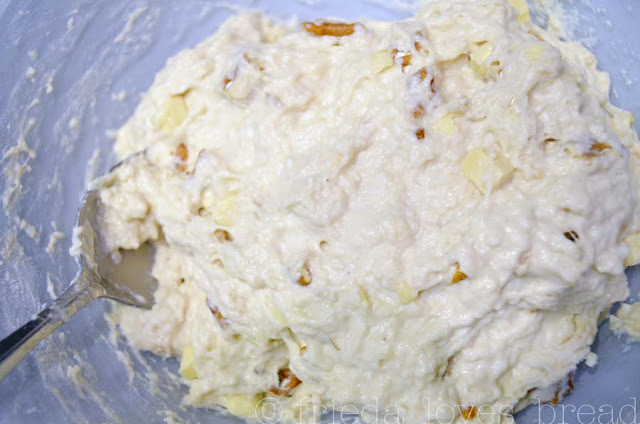 Using floured hands (or two dough scrapers), pick up this dough and put it in a heavily floured kitchen towel (linen, or cotton, NOT terry cloth) or, my favorite, a parchment paper lined bowl. Let your dough sit, covered, for 1-2 hours, until doubled. 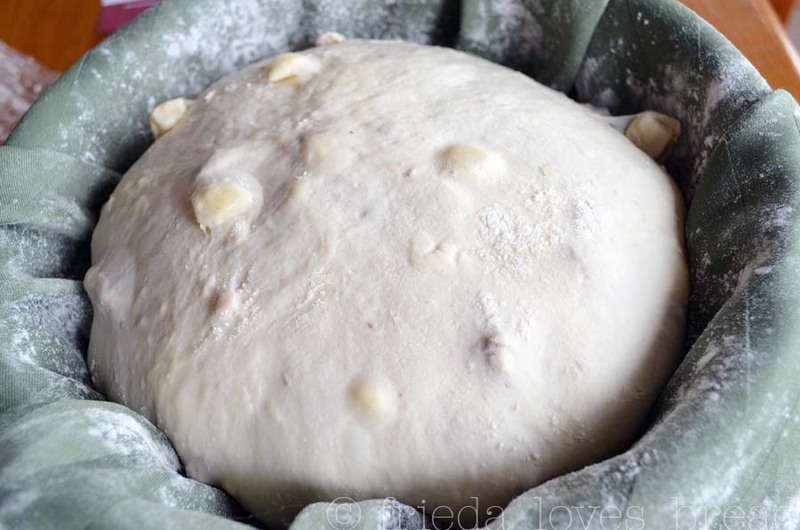 Dough should feel springy and light when touched. This bread has doubled and is ready to go into the oven. Next, put a 2-6 quart dutch oven, Pyrex glass dish, oven safe pot, or removable crock pot liner, with a LID, into your oven. Preheat the oven to 450°F. 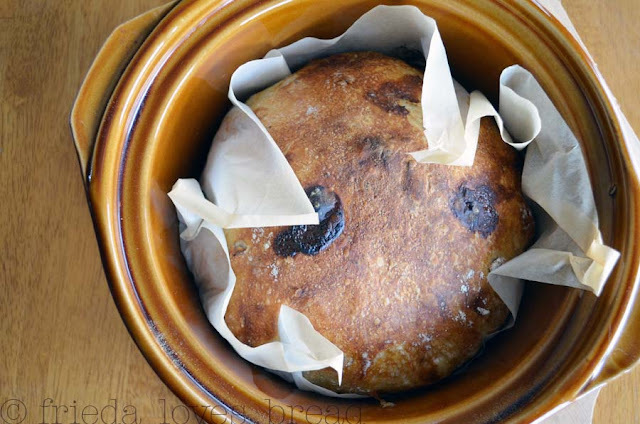 If you have your bread in a cloth lined bowl, you will need to invert the dough into the hot pan in the oven. If you are using parchment paper, all you will have to do is lift the bread, parchment and all, into the hot pan in the oven, using it like a "sling." Much easier, in my opinion. Bake in the oven with the LID ON, for 30 minutes, then take the LID OFF for an additional 10-15 minutes, to brown the top of the bread. Take the bread out and let it cool for at least an hour on a wire rack. I know, I know ... it's hard to wait! The bread is still cooking and if you were to cut into it right away, it would be a doughy mess inside. Let's take a look ... See those extra large holes near the bottom? 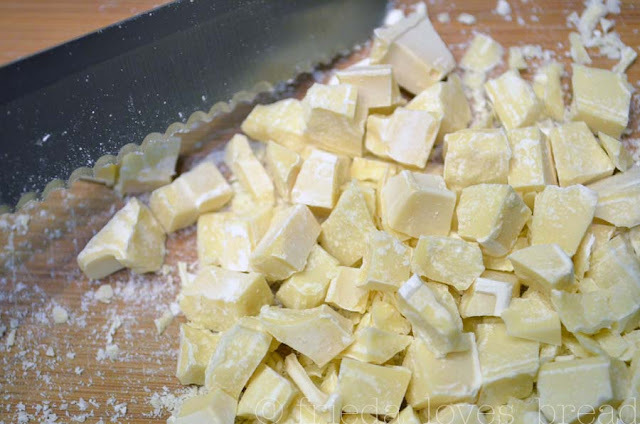 That is soaked with melted white chocolate. Oh, so good .... I hope you will give this bread a try! This looks absolutely delicious! My grandma used to buy me a white chocolate pecan bread that had dried cherries in it from a little shop that has since closed. I cannot wait to try this! I'll add dried cherries and see how close it is. Thanks! Sounds wonderful! Toss in the dry cherries in the flour to coat; this will prevent them from sticking together. You are amazing! This bread is perfect--I can't remember if this is the white chocolate nut bread that Harmons sells or not, but I'm always asking for a little slice. If I buy the whole loaf, I know I'll eat it all myself! Great job, it looks so simple and easy to make and eat! 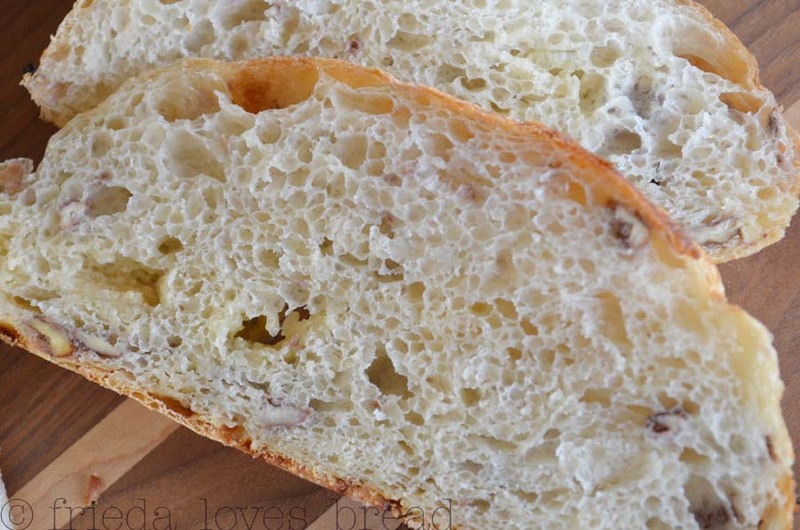 I love the bread at Harmons ~ the taste of this recipe is the same, but the texture is different; more holes, lighter, and moister. I hope you give it a try...this way, you can have your favorite bread any time you want! Holy Moses, that looks TERRIFIC! My husband and I just tasted this bread at the new Harmons on Saturday so your timing couldn't be more perfect. That's brilliant about the baking chocolate, too. 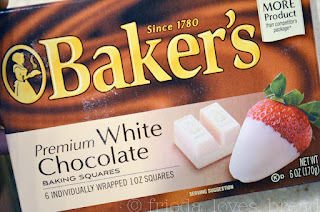 I would just have tried the white chocolate chips and then wondered why I had chunks instead of that lovely ooze. I think I have a loaf of this bread in my future. Thanks! 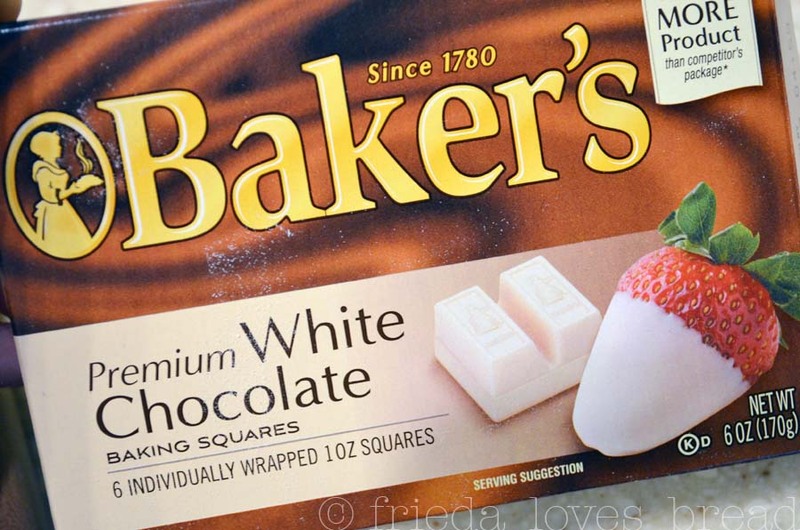 O-M-G. White chocolate in bread?? I need to give this a try, looks fantastic, I can even link the screen!! Wow how amazing does that look? I cannot wait to try this out. Thanks for sharing it with us. Come visit. We have some terrific things to share with our readers this week. The most awesome bread ever!! I am making this today, for the fifth time. We LOVE it!